I will have to go and check but I thought Filmer was actually arguing for an absolutist monarchy or what we would properly call “patriarchal”. I think there’s a grave distinction to be made between the Roman idea of the “People” and the patriarchal view of political society which evolved out of the Middle Ages. In the one, we have different classes of people; in the other, we have a whole people in the manner of the family with the King as the head. I would actually argue that Locke’s view of the “People” is a radical view developed from the Civil War period and is centred upon the idea of evangelical equality before God. It’s not patriarchal as it does not make an order in society except within the family. So, in a way, Locke is arguing for a view of the state which is “unnatural” in that the state and the family are not mirrors of a greater ideal. Locke is still way too radical for upper-class comfort. I recall that the late Richard Ashcraft who wrote about JL while a professor of political science at “red” UCLA, was considered something of a misfit and kook. This decodes antidemocratic propaganda, starting with the 17th century. 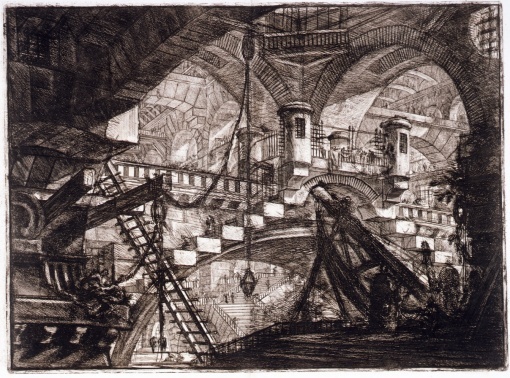 Filmer, Locke, and Piranesi are the leading characters.